Scottsbluff was founded in 1899 across the North Platte River from its namesake, a bluff that is now a U.S. National Park called Scotts Bluff National Monument. The monument was named after Hiram Scott (1805–1828), a fur trader with the Rocky Mountain Fur Company who was found dead in the vicinity on the return trip from a fur expedition. The smaller town of Gering had been founded south of the river in 1887. The two cities have since grown together to form the 7th largest urban area (Scottsbluff Micropolitan Statistical Area) in Nebraska. Scottsbluff was laid out in 1899 when the railroad was extended to that point. In the Lakota language, Scottsbluff is called pȟaŋkéska wakpá otȟúŋwahe ("Platte River City", lit. "abalone river city"). Scottsbluff is located at 41°52′2″N 103°39′39″W﻿ / ﻿41.86722°N 103.66083°W﻿ / 41.86722; -103.66083 (41.867140, −103.660709). According to the United States Census Bureau, the city has a total area of 6.27 square miles (16.24 km2), of which, 6.22 square miles (16.11 km2) is land and 0.05 square miles (0.13 km2) is water. 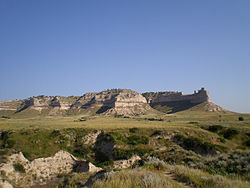 Scottsbluff has a semi-arid climate (Köppen climate classification BSk), with wide seasonal and day-to-day variation as well as a large diurnal temperature variation, and is located in USDA Plant Hardiness Zone 5a. Summers are hot, and winters dry and cold, though chinook winds can loosen the cold's grip, often bringing temperatures above 50 °F (10 °C). The monthly daily average temperature ranges from 26.1 °F (−3.3 °C) in December to 74.1 °F (23.4 °C) in July. Over the course of a year, there is an average 5.3 days with maxima 100 °F (38 °C) or above, 45 days with maxima reaching at least 90 °F (32 °C), 29 days with a maximum at or below the freezing mark, and 13 days with minima at or below 0 °F (−18 °C). Extremes in temperature have ranged from 110 °F (43 °C) on July 11, 1939, down to −45 °F (−43 °C) on 12 February 1899. The year 1989 saw temperatures as extreme as 109 °F (43 °C) and −42 °F (−41 °C), whilst the month of February 1962 saw temperatures as hot as 77 °F (25 °C) on the 11th and as cold as −28 °F (−33 °C) on the 28th. Precipitation is heavily concentrated in the spring and summer months, with only May and June averaging over 2 inches or 50.8 millimetres. The wettest single day has been June 7, 1953 with 3.18 inches or 80.8 millimetres of rain, whilst the wettest calendar month on record has been June 1947 with 8.33 inches (211.6 mm) and the wettest calendar year 1915 with 27.48 inches (698.0 mm). The months of November 1939 and March 2012 did not see even a trace of precipitation, whilst nineteen other months since 1893 have seen only a trace. The driest calendar year has been 2012 with 6.99 inches (177.5 mm). Snow typically falls in light amounts, with a 1981−2010 seasonal average of 42.1 inches or 1.07 metres; the most snow in one month has been 31.3 inches (0.80 m) in October 2009, and the greatest depth of snow on the ground 23 inches or 0.58 metres on April 14, 1927. The most snowfall in a season is 81.9 inches or 2.08 metres between July 2009 and June 2010; the least snow being 13.5 inches or 0.34 metres between July 1933 and June 1934. As of the census of 2010, there were 15,039 people, 6,168 households, and 3,672 families residing in the city. The population density was 2,417.8 inhabitants per square mile (933.5/km2). There were 6,712 housing units at an average density of 1,079.1 per square mile (416.6/km2). The racial makeup of the city was 83.0% White, 0.8% African American, 3.4% Native American, 0.8% Asian, 9.8% from other races, and 2.2% from two or more races. Hispanic or Latino of any race were 29.1% of the population. There were 6,168 households of which 30.5% had children under the age of 18 living with them, 41.7% were married couples living together, 12.5% had a female householder with no husband present, 5.3% had a male householder with no wife present, and 40.5% were non-families. 34.6% of all households were made up of individuals and 14.3% had someone living alone who was 65 years of age or older. The average household size was 2.35 and the average family size was 3.04. The median age in the city was 36 years. 24.9% of residents were under the age of 18; 10.7% were between the ages of 18 and 24; 23.8% were from 25 to 44; 23.7% were from 45 to 64; and 16.7% were 65 years of age or older. The gender makeup of the city was 47.6% male and 52.4% female. According to a 2009 article in Quality Health entitled 10 Fattest Cities in America, 31% of Scottsbluff's population is obese, making it the 7th fattest city in America. As of the census of 2000, there were 14,732 people, 6,088 households, and 3,841 families residing in the city. The population density was 2,504.5 people per square mile (967.4/km²). There were 6,559 housing units at an average density of 1,115.1 per square mile (430.7/km²). The racial makeup of the city was 81.88% White, 0.44% African American, 3.20% Native American, 0.75% Asian, 0.04% Pacific Islander, 11.60% from other races, and 2.10% from two or more races. Hispanic or Latino of any race were 23.59% of the population. There were 6,088 households out of which 30.6% had children under the age of 18 living with them, 46.7% were married couples living together, 12.9% had a female householder with no husband present, and 36.9% were non-families. 32.4% of all households were made up of individuals and 14.7% had someone living alone who was 65 years of age or older. The average household size was 2.36 and the average family size was 2.99. In the city, the population was spread out with 26.5% under the age of 18, 9.8% from 18 to 24, 25.2% from 25 to 44, 20.7% from 45 to 64, and 17.8% who were 65 years of age or older. The median age was 36 years. For every 100 females, there were 87.0 males. For every 100 females age 18 and over, there were 82.1 males. As of 2000 the median income for a household in the city was $29,938, and the median income for a family was $37,778. Males had a median income of $30,307 versus $20,854 for females. The per capita income for the city was $17,065. About 14.5% of families and 18.3% of the population were below the poverty line, including 28.5% of those under age 18 and 10.0% of those age 65 or over. Scottsbluff is home to the main campus of Western Nebraska Community College. In addition, several other Nebraska institutions maintain centers and offer select courses or programs in the city, including the University of Nebraska Medical Center College of Nursing, Chadron State College, and the University of Nebraska (Panhandle Research and Extension Center). The now-defunct Hiram Scott College was also located a few miles north of the city. The Midwest Theater in downtown Scottsbluff is listed in the National Register of Historic Places. N-92 Nebraska Route 92 - route going west from Scottsbluff to Wyoming border. The Scottsbluff area is served by Western Nebraska Regional Airport. United Express serves the airport with twice-daily service to Denver International Airport. Hank Bauer, former American football running back, professional television and radio broadcaster. Walt Conley, folk singer, musician and actor. Kip Gross, retired Major League Baseball pitcher for the Cincinnati Reds, Los Angeles Dodgers, Boston Red Sox, and Houston Astros. Jacqueline Logan, silent film actress spent her childhood in Scottsbluff. Vic Marker, three-time Midwest Golden Glove boxer, who beat Archie Moore in the Golden Glove Finals in the late 1930s. ^ "The Twin Cities: Gering and Scottsbluff". Center for Advanced Land Management Information Technologies. University of Nebraska. Retrieved August 23, 2014. ^ "USDA Plant Hardiness Zone Map". United States Department of Agriculture. Retrieved August 13, 2018. ^ a b c d e f "NOW Data – NOAA Online Weather Data". National Weather Service, Cheyenne, Wyoming. Retrieved August 13, 2018. ^ a b "Threaded Extremes". National Oceanic and Atmospheric Administration. Retrieved August 13, 2018. ^ "Station Name: NE SCOTTSBLUFF HEILIG AP". National Oceanic and Atmospheric Administration. Retrieved August 13, 2018. ^ "Platte River Basin Environments : Wildlife Habitat Lands". www.nebwild.org. Retrieved March 4, 2016. ^ "Scottsbluff United States Post Office--Scotts Bluff National Monument, Nebraska: A Discover Our Shared Heritage Travel Itinerary". www.nps.gov. Retrieved March 4, 2016. ^ "Midwest Theater « Scottsbluff Historical Theater". midwesttheater.com. Retrieved March 4, 2016. ^ "Lincoln Hotel--Scotts Bluff National Monument, Nebraska: A Discover Our Shared Heritage Travel Itinerary". www.nps.gov. Retrieved March 4, 2016. ^ "Bluffs Middle School - Bluffs Middle School". www.sbps.net. Retrieved March 4, 2016. ^ "Scottsbluff High School - Scottsbluff High School". www.sbps.net. Retrieved March 4, 2016. ^ "Scotts Bluff County Courthouse--Scotts Bluff National Monument, Nebraska: A Discover Our Shared Heritage Travel Itinerary". www.nps.gov. Retrieved March 4, 2016. ^ "Scottsbluff Carnegie Library--Scotts Bluff National Monument, Nebraska: A Discover Our Shared Heritage Travel Itinerary". www.nps.gov. Retrieved March 4, 2016. ^ Staff, From; Reports, Wire (April 19, 1996). "Berringer Dies in Plane Crash". Los Angeles Times. ISSN 0458-3035. Retrieved March 4, 2016. ^ LTC. "Nebraska Legislature - Warner Institute for Education in Democracy". www.nebraskalegislature.gov. Retrieved March 4, 2016. ^ Fritz, Tim. "Walt Conley: The Founding Father of the Denver Folk Scene". washingtonstreetmedia.com. Retrieved November 17, 2017. ^ "Kip Gross Stats". Baseball Almanac. Retrieved December 3, 2012. ^ "Randy Meisner Bio | Randy Meisner Career". CMT Artists. Retrieved March 4, 2016. ^ "Miss America : 2011". www.missamerica.org. Archived from the original on 5 March 2016. Retrieved 4 March 2016. Wikimedia Commons has media related to Scottsbluff, Nebraska.